Veto Pro Pac bags have been pretty popular among HVAC technicians, and now it looks like they will have a brand new line of Veto bags that have been specifically designed to meet their needs. The Tech bags have been designed based on user feedback, surveys, and field testing. The difference in the bags is due to the specific hand tools and diagnostic tools that HVAC and other technicians require. The Tech-LC is the first of the new bags. It features a total of 53 pockets that supports tools including hand tools, parts boxes, meters, cordless drill and other bulky tools. Like the reintroduced Veto Laptop bags, these new bags feature some neoprene pockets that are able to stretch to better hold curtain tools. 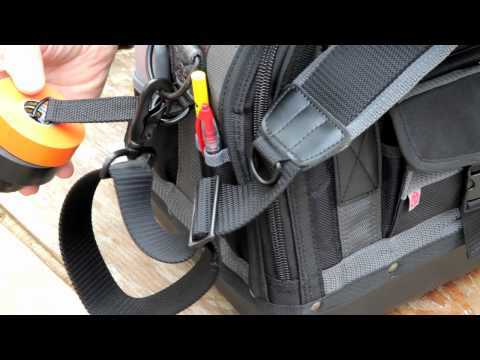 The Tech-LC also uses a new hook to keep the shoulder strap off of the ground. Also introduced were the smaller MB – Meter Bag, and the TP3 – 3 Pocket Pouch. Both of these bags are much smaller than the typical Veto bags and are intended as service call bags.